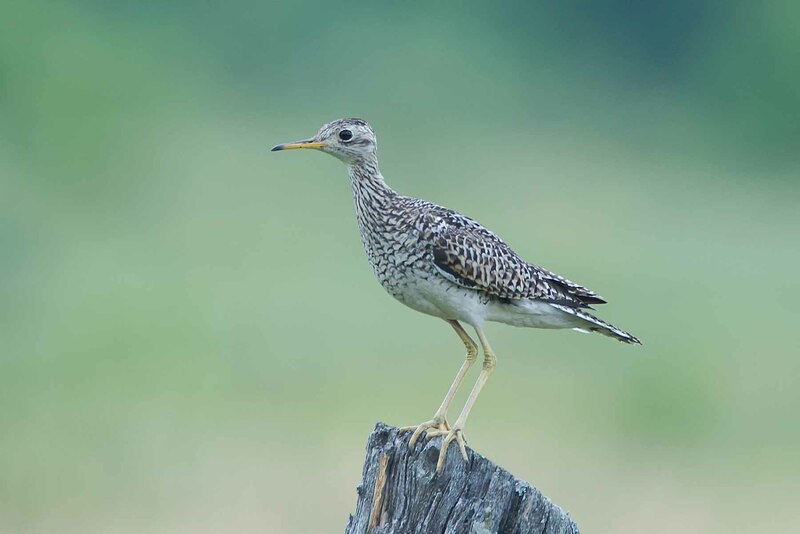 It wasn’t to long ago that I saw my first Upland Sandpiper, as a matter of fact it was 6 years ago in 2006. Recently I heard that a few of these birds had been seen in the Dwyer Hill Road – Panmure area. So off I went in search of a better photo for my collection. I search the area for at least an hour but I couldn’t find a single bird. Being in no hurry to get back home, I decided to do a big circle through Galletta, Constance Bay and Dunrobin and see what I could find. While driving on Concession Road 12 off of Panmure, my eye caught sight of a Sandpiper on a post. Not in the best light but close..I hoped he’d sit still and give me a chance. Give me a chance he did, I managed to fire off about 10 images, from about 25 feet, before he flew further afield and out of camera range…below is the best of ten. I was using my D3s with a Nikon 300 f4 lens with a 2X teleconverter, handheld.